Jamie and Adam are Fun In The Sun Weddings’ newest Newlyweds! This wedding was a total blast to be a part of. Not only are Jamie and Adam very dear friends of ours, but they are an insanely fun pair…and that is what Fun In The Sun Weddings is all about! So, when we are asked to shoot the wedding photos for their beach wedding in Cabo San Lucas, Mexico, we lept at the opportunity! Jamie and Adam met seven years ago while training for a new job they had both started at a popular steakhouse in Vancouver, Canada. The bride tells us that it was at a steak seminar when she first noticed her future husband. Adam was pointed out and asked to stand up, and bend over on his fours like a cow so the teacher could point out on him where each cut of meat on the cow was. Jamie didn’t listen to a WORD the instructor was saying. She was much too busy staring at this dreamy man she had just laid her eyes on wondering if he was single…. Apparently, Cupid’s bow struck twice that day because Adam had pointed Jamie out to a few of the staff members too. He asked one of the girls to dig into her personal life a little and figure out if she was dating anyone. When Jamie found out he was asking, it was game over. Fast forward a few years, to where Adam and Jamie took a trip to San Francisco for their seventh anniversary. It was there that he decided to pop the question. Intending to get down on one knee at the Golden Gate bridge, Adam got impatient and instead proposed shortly after they arrived while they were out exploring the city. Descending from a lookout point, on a long, steep stairwell, he pulled out the ring. When Jamie turned around he was holding the ring out with both hands. After a long second of silence he managed to nervously spit out those four big words., and Jamie screamed! They were both on cloud nine, laughing that her knuckle was too fat to fit the ring because he had sized it to a ring she wears on her right hand. She wore it on her right hand for the rest of the trip. 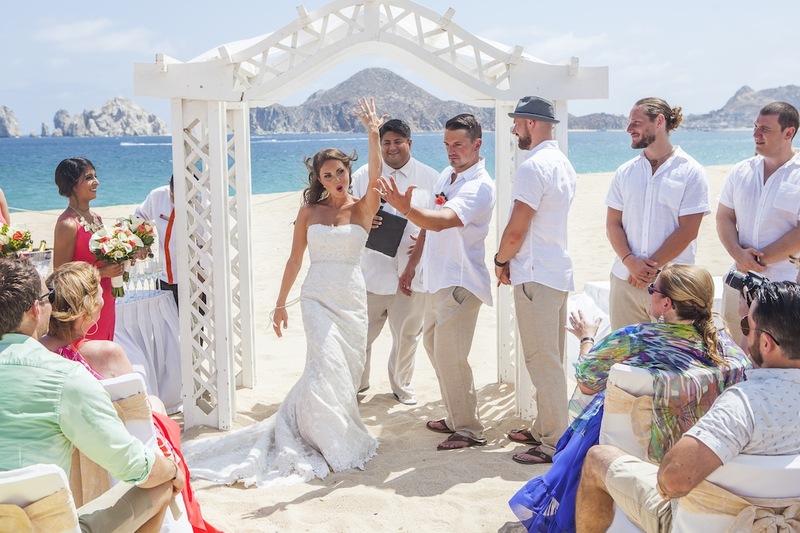 They were married at The Riu Palace in Cabo San Lucas because they loved the idea of getting married on the beach. Toes in the sand, drinking beers and tequila all day and night, with no over the top planning as the all-inclusive resorts do almost all of it for you. They also LOVED the idea of having a week-long celebration for all of their family and closest friends to share. This meant a lot to them, and it was a week of so many memories. Jamie found her perfect beach wedding dress at The Bridal Gallery in Vancouver, Canada. The dress she chose was nothing like what she was looking for. Her mom had actually picked it out for her to try on. Once she looked at herself in the mirror, it was the first dress that made her feel like a bride. As a testament to how awesome these newlyweds are, Jamie told us that they just wanted everyone to have a beer in their hand and be having the time of their lives! They wanted it to be casual and fun. She had prepared herself for small things going wrong but was surprised at how smooth the whole wedding day went. Adam’s concern was music. They had all of the playlists on his IPhone, and he was a little worried the wrong songs would play during the ceremony. It turns out, everything ended up being perfect! These two were such a treat to photograph, and their easy-breazy attitudes come shining through in their wedding photos. 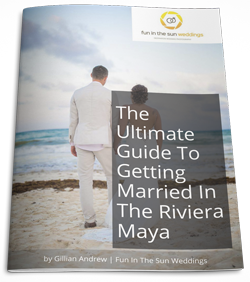 And let me tell you, it’s no small feat to stay joyful and relaxed when you get married in Mexico, in the summer, during the hottest time of day! These two are truly special, and we wish them every possible happiness as they start their lives together as husband and wife! Congratulations Jamie & Adam! ***AND HEY! 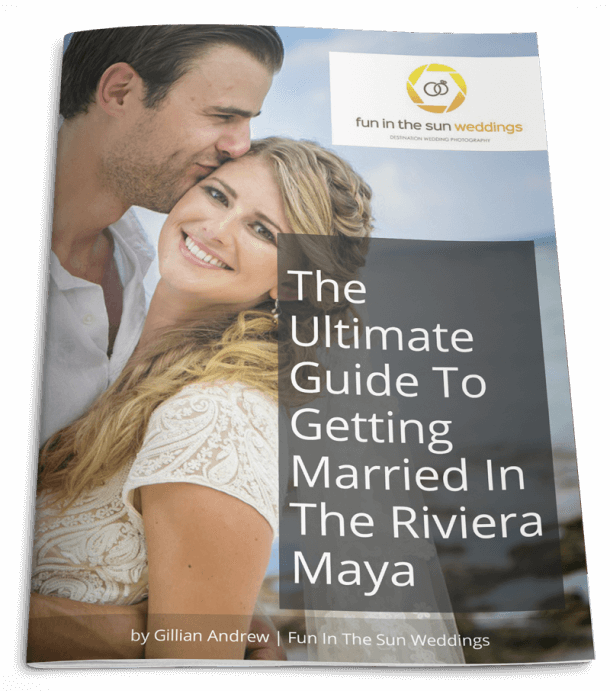 If you are looking for the best Riviera Maya wedding photographers who will travel to Cabo San Lucas for your wedding, then contact us today! We are Fun In the Sun Weddings, the best Playa del Carmen wedding photographers. Want to know more about Riu Palace in Cabo? Read unbiased reviews on Tripadvisor here. My husband and I have known Marc and Gill for a long time, and right when we got engaged we knew right away who we wanted to do our photography! Marc is insanely talented and creative. I've had the pleasure of working with him in Vancouver on a few jobs and while he is the most outgoing, hilarious person you will ever meet- he is extremely professional. We were so excited when they said they were able to shoot our wedding, I've seen tons of Marc's photo's and already know how amazing he is so it put my mind at ease that no matter what, my wedding photos would turn out amazing.  He captured such fantastic, sentimental shots without us even knowing he was there. He was also so open to any ideas Adam and I had. He was so excited while shooting our wedding , you would have thought it was his first wedding! It's so refreshing to have a photographer like that instead of someone who's just getting the job done. He went above and beyond in every aspect. Also- I have to say that even though my husband and I already knew Marc and Gill- if your wedding is your first time meeting him, you will feel like he has been your friend for years after ten minutes and that is so important in making the shooting experience as comfortable as possible. Fun in the Sun Weddings is the only photography company I would recommend for any upcoming brides and grooms!